I wanted to share this with you because I feel very validated that Terry Petersen not only really got the message I was hoping to convey in Dancing in Heaven, she was able to express it. I watch my precious six-year-old Ella in Occupational therapy as she threads the letters to her name through a fluorescent green pipe cleaner. She recognizes the letters—she has been reading for more than a year. But she struggles through fine motor skills exercises because of her small hands and shortened fingers. typical for persons with Down syndrome. At times she breaks away and puts on a show, her head between her knees, a look-at-me-I’m-cute expression on her face. I remain calm without reacting, showing no censure. Only what I hope is a you-can-do-it look. The OT is in charge. And she encourages Ella. With both experience and love. Arthur just might be able to catch a squirrel, if it is a baby squirrel. I found that out this morning. Mark and I were sitting at our kitchen table after breakfast where we have a view of our driveway and the garden and woods beside our house. Mark was reading the news on his iPad and I was playing Lumosity, trying to keep my wits sharp, and not doing a very good job at it. “Arthur doesn’t even see that squirrel,” Mark said. Arthur, who was in the near vicinity of a squirrel on the driveway. He never allows a squirrel to be in the yard without a chase. If he’s inside looking out at the squirrels, who scavenge bird-feeder droppings on our front porch, he starts barking. “Do you want to get the squirrel?” I’ll say. And Arthur races for the front door, taking the turns around the staircase on three legs. He’s never going to catch a squirrel, but he doesn’t know that. This morning, I couldn’t see Arthur on the driveway from where I sat, but I could hear him barking. I stood up, went to the door, and saw this baby squirrel on our wind wall post. “Oh no. Arthur’s got the squirrel trapped,”I said. I thought it was cute because I never believed for a minute this would end with a satisfying result for Arthur, but he was revved up by the chase. I did what I always do, reached for my camera, stepped outside, and started shooting. This clearly wasn’t good enough for Arthur. He was going in. Meanwhile, the assumed parent squirrel could only wait and hope as he or she watched from a nearby tree. Arthur darted in and around the post trying to find a way to access the squirrel. Clearly this baby was terrified. That’s enough, I thought. I’ve got to get Arthur away. Easier said than done. There was no way this undisciplined little canine was going to come when I called. I was afraid to approach the squirrel for fear it would panic and get itself into a more vulnerable position. That was exactly what happened. It jumped to the bushes, fell to the ground, back to the bushes, back on the post, then repeated with Arthur inches behind it. Finally the squirrel gave up on the post and tried to make a run for it. Arthur chased it behind the bushes beside the house. The squirrel passed by a tree that could have saved it, and continued on to the porch with Arthur and me, my camera dangling from the strap around my neck, in hot pursuit. Arthur had the little guy cornered against the wall of the porch. And I could see all the games we played with his toy squirrel had trained him well for the darting, pawing, and biting he was attempting. I didn’t think, but merely reacted when it looked like Arthur had his prey. I lunged for Arthur and landed full force on my bad knee on the cold hard concrete, banging the lens of my camera against the concrete in the process. But I bought the squirrel enough time to make it to the boxwood bushes where the chase continued. I watched helplessly, sitting on the cold concrete, yelling for Mark. Mark came and had no better luck than I at grabbing Arthur, but much better luck at not injuring himself during the chase. Finally, the little squirrel jumped to the tulip tree at the corner of the house and achieved relative safety. Mark helped me up and eventually managed to lure Arthur away from the hunt with pieces of cooked chicken. I didn’t know if Arthur had injured the baby squirrel until I saw it a few minutes later with the parent. Baby looked fine as far as I could see. Arthur was never thanked by the squirrels for his role in the valuable lesson in vigilance, awareness, and evasion. And I will be icing my knee today. I wrote and published Where Memories Meet with the goals to educate and commiserate. I wanted to give readers who had little to no experience with Alzheimer’s a clear understanding of what was involved, as least to the extend that my family experienced it, and I wanted to reach out to those who were currently, or had been, dealing with a loved one with Alzheimer’s and let them know they were not alone. I understood. A few weeks ago I received my first negative critique of Where Memories Meet. (The good reviews I rush to post, the negative ones, not so much.) As a writer it can be demoralizing and utterly discouraging when you receive negative feedback. It took me about a week to lick my wounds and resurface from the cave I had crawled into. I requested feedback from a Writer’s Digest contest I had entered the book in, and the critique came as an email with the subject line, “You asked for it.” Which I’m sure was their standard response, but which particularly drove the point, and it was a sharp one, home. The reader clearly didn’t like the book, and after reading the comments, I suspected he or she hadn’t read very far into it. The critique quoted a particularly benign sentence from page 13 and I seriously question whether the reviewer read any further than that. The reviewer informed me that when one was writing about life and death matters, it was important to bring the character to life. I agree. In fact that was one of my most important goals and guiding principles as I wrote Where Memories Meet. I aimed to transform my father for the reader. And I took the risk of moving my story line backwards in steps through the seasons to do so, even though some readers found that difficult. I wanted the reader to see that the silent, largely non-responsive human life was a bright, multi-faceted, productive, and devoted father and husband before the disease took him away piece-by-piece. Or maybe I should say, “inch-by-inch.” Had the reviewer finished the book, I believe he or she would have seen that. He or she also chose to compare my nonfiction memoir and oral narrative to the fictional Still Alice. I read Still Alice. I liked Still Alice. I was not writing Still Alice. I was not writing fiction. I read a lot of nonfiction, and today authors are doing an increasingly better job at making nonfiction compelling reading. I acknowledge that I might have been better at doing this. What hurt the most was the reviewer’s comment that I told the story “inch-by-inch.” In my cave, licking my wounds, I chewed on that one for a good long while. When I resurfaced, I responded to the Writer’s Digest contest. I was particularly disappointed because I had always viewed WD as a help and encouragement to writers, in particular to self-published writers. I didn’t find anything about the feedback I received to be helpful—only mean-spirited, discouraging, and demoralizing. I told them the review made me feel like I should apologize for asking the reviewer to read my book. I said that I made a mistake in entering it in the contest, and that was a mistake I would not be making again. The positive outcome from this painful episode is that the reviewer unwittingly nailed it on the head, gave me a new insight into my family’s experience, and inspired me to write the post at my author website, Inch by Inch, about helping someone with Alzheimer’s. I’ve mentioned Jeffrey S. Hillard here before. He was one of my professors when I returned to college at Mount St. Joseph University for an English degree in the early 2000s. I took two creative writing classes from him: Short story, and Poetry. Jeff is a gifted poet. I think you’ll agree when you read it. It is accessible, and it sings. This year he received the honor of being named the Cincinnati Public Library Foundation’s Writer in Residence. You can read all about it here. He is also an inspiring teacher. This week Jeff published a blog post on the library site entitled, Anatomy of a Poem (1). If you have any interest in reading good poetry, understanding poetry, or writing poetry, this is a must-read. This is where Jeff really shines. I want to share with you a newsletter from an emerging great fiction writer, Trace Conger, in which he announces a Countdown sale of the Kindle version of his latest novel Scar Tissue. (He also gives my upcoming Kindle Countdown deal for Where Memories Meet a plug.) 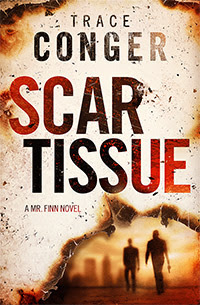 Tomorrow, for one day only, you can buy Scar Tissue for $0.99, a savings of $4.00, at Amazon. It’s a great opportunity for readers to try Trace’s work. I met Trace when he joined the writing group I have been participating in for about five years now. I’ve enjoyed reading and providing feedback on Trace’s works-in-progress. He is a talented, entertaining, and highly productive writer. I believe he has what it takes to be a successful fiction writer. Trace Conger has done it again, and for that matter, so has his lead character, Finn Harding. Finn is an unlicensed private investigator who gets embroiled with large ruthless criminal organizations. Finn’s bravado, quick wit, command of the internet and research, and generally ingenious and devious mind, as he works to solve the case while saving his own skin, make for a fast-paced and riveting read. One of the things that sets Conger’s Crime Fiction apart is his integration of the humanity of Finn. We see Finn’s fierce devotion and protectiveness to a precious daughter and his estranged wife, who is not only hot but has the right mix of vulnerability and sass. And perhaps even more entertaining, we get to witness the escapades of Finn’s father Albert and his old codger vigilante friends up at Meddybemps Lake in Maine who provide us with a second, equally fascinating, story line. With the addition of Finn’s long-lost brother Conner, who plays a significant role in Scar Tissue, we are offered a deeper look into Finn’s engaging character through his family ties. And as we watch the interactions of the Harding brothers, we realize these two apples did not fall far from the tree. I loved it. I can’t wait for the next. Highly recommended. Hello friends. I’ve received a lot of emails asking about the next Mr. Finn novel. I’m hard at work on THE PRISON GUARD’S SON (Mr. Finn #3) and hope to have it available this fall. I’m really excited about this book and it’s been a blast to write. As I’ve written the series, I’ve always tried to “up the difficulty” when it comes to Finn finding his man. The first book focused on an anonymous hacker and the second on a nomad criminal banker. The third book finds Finn trying to track down two individuals in the witness protection program. I think it’ll prove to be his toughest case yet. I can’t share too much about the plot, but if you want a glimpse into what Finn is up against, I’d suggest checking out a recent piece I wrote for Hardboiled Wonderland, a crime fiction blog. You can find that here. The ebook price will steadily increase that week until it’s back at its normal sales price. So, mark your calendars if you want the book and want to save some cash. A good friend of mine recently published a fantastic memoir, WHERE MEMORIES MEET. It’s the author’s story of losing her father to Alzheimer’s as well as her father’s account of the defining moments of his life. It’s more than a story about Alzheimer’s though. It’s also a touching tribute to a man who meant so much to her. Sure, it can be dark at times, but so can life. WHERE MEMORIES MEET will also be on sale for $0.99 from February 1 to February 4. Of course, if you want to snag it at full price, you can do that too. Check it out here. You can contact Trace and sign up for his newsletter at his website, TraceConger.com.